The poet exchanges gifts with his family; he gives his mother a book, a graphic novel, which is read immediately. The poet’s mother identifies a section of the text and indicates that the page is question is a shared component of their past. The page depicts a totem pole in the Royal Ontario Museum. The poet’s mother inquires if he remembers being there. But the poet does not hold that memory. The poet simply recalls the train car and the heat. Momentarily, the poet is surprised and ashamed that the pole that was removed from his ancestral village has also been excavated from his own memories. The poet returns to Vancouver, his birth city, after a twenty-one year absence. The poet investigates the last known locations of his father; the poet internalizes the procedures of the city; the poet exchanges premeditated extrapolations for physical grandiosity. The city indulges the poet’s weakness for vegetation and water-adjacent sand; the city believes in authenticity of beauty and strategically located totem poles. Given the City of Vancouver’s recent formal declaration that Vancouver is on unceded First Nations territory while at the same time the City contributes to the growing numbers of an already large Indigenous homeless population, it's clear that the City is willing to strategically capitalize on the region’s authentic First Nations history and culture to increase tourism and property values. Muriel Majorie, of the Gitxsan Nation, a social justice activist, poet, and performer in Vancouver, says a totem pole is a story pole. Haida artist Skundaal (Bernie Williams) of the Raven clan, Bill Reid’s only female apprentice, is currently at work on the Survivor’s Totem, using a 980 year-old cedar pole from Haida Gwaii where the carver was born. It will tell the story of the First Nations, Japanese, Chinese, South Asian, and black communities who experienced colonization, exclusion, racism, and often displacement. It will be raised in Vancouver’s Downtown Eastside, where many of these survivor communities were or are located. It is particularly relevant that this history be shared with the public as more and more low-income people are displaced by City-supported gentrification. Of his own volition, the poet returns to Toronto, confident that he will be reunited with the totem pole removed from the Nass River by Marius Barbeau. The poet confronts the admission staff member at the ROM, explains that he refuses to pay to see a totem pole that was taken from his ancestral village. The staff member initiates a lethargic request to allow admission under special circumstances but is unable to contact any of his superiors. The staff member shrugs, verbalizes his apathy, and allow the poet into the museum. The pole towers through the staircase; the poet circles up to the top. The pole is here; the poet is here. 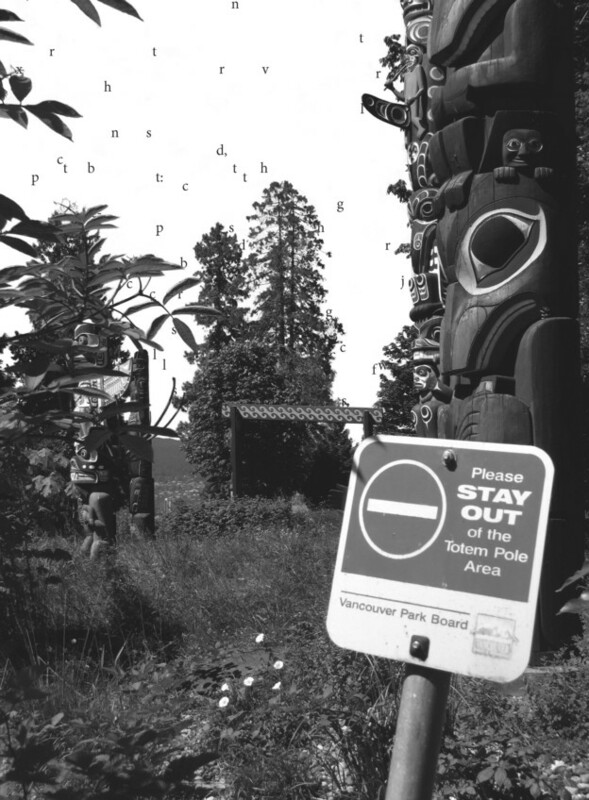 Totem poles can claim territory, can declare, “we are here.” Abel's work is an important reclamation of territory, removing Sakau'wan's totem pole from the colonial museum, establishing a space for it within The Place of Scraps.